Question: You say that “spirituality” is when the other is more important to me than myself. How can a person want that? Isn’t there anything else to it? Answer: Yes. This is indeed spirituality. What’s more, you are given everything that you want except bestowal upon others, and you constantly choose only that. The whole point here is the clarification of the vessels, desires. No one is asking us to do something that is above our nature. We are simply changing, and then we discover that the attribute of bestowal is important for us, not in the egoistic sense anymore, but in itself. You are not taking into account the actions of the Light that Reforms, but in the meantime it influences a person and so a person changes. What’s more, he changes in such a way that he doesn’t have the same mind and feelings he had before; everything changes and becomes new. So we have to allow the Light to operate. Let it do its job, open yourself to the action of the Light; it’s on the outside, surrounding us, so let it touch you; let it touch your desires, which you now cover from the Light. The moment it starts to operate, you will see how everything changes. It’s because we are in a world that is on the lowest level, restricted, “specific”; we are limited in time, motion and space. It’s simply awful, but we don’t understand what is going on. Great distances separate us and are between our understanding, our feeling, and our attainment. They were created as a result of our desires, as each one is focused on its self-benefit. Today we simply don’t understand that we are living in a tiny meaningless dimension, we live and die not knowing where our mind and feelings are, sunken in the bottom, in lowliness. So let the Light influence you a little. You cannot even imagine its attributes. It isn’t just “bestowal,” it’s a different dimension in which the importance of others is not a source of confusion and embarrassment. Expect the Light to save you. Question: What does “the departure of the body” mean? Answer: The desire to receive disappears in its previous form, and it is as if you acquire a new vessel instead, a desire to receive in order to bestow. In this vessel you discover the Creator, the Light, your eternal life. All your egoistic attributes take on the opposite form by the restriction and a Masach (screen), an intention and the dressing of the Returning Light. Now this is your life. So, the transition from the intention of in order to receive to an intention of in order to bestow is called “the departure of the corporeal body.” Although the desire to receive was formed as “something from nothing,” it exists eternally. Without this it wouldn’t be a created being, a desire to receive fulfillment and pleasure. There is nothing we can do with it, but only to reveal or conceal it according to the different states. 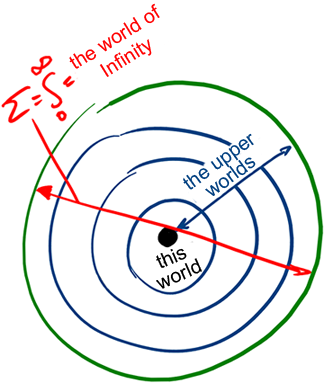 By revealing the desire a little, you see “this world.” Greater revelations are called “the upper worlds.” Eventually you discover the whole “sphere,” in its full scale (∑), in every direction, and rise to the “integral” (∫) from zero to Ein Sof (Infinity), or to the world of Ein Sof. The desire to receive is divided into “layers:” from the root phase to phase four. We can restrict (Tzimtzum) the desire and then you cannot use it in any way. You can also put a Masach on the desire, and then you can use it and operate it to the depth of the different layers. 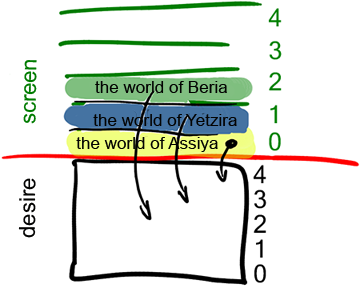 If you use the Masach at the Aviut (thickness) of the root phase, you feel the world of Assiya. In the Aviut of phase one you feel the world of Yetzira, in the Aviut of phase two you feel the world of Beria, etc. At the same time, the desire to receive doesn’t disappear, but it is as if you always work above it. Of course, you still remain in it, but schematically we present it as an ascent. We can say that the attributes that are corrected by the Masach “descend” and take their place in the Aviut of the desire to receive. Question: Currently, the phrase “corporate culture,” has become very fashionable. Companies even hire managers who specialize in corporate culture. Can one person form a culture? What does culture mean in general? Answer: Culture is a level of mutual friendly relations between people. When do we consider a person to be uncultured? It is when he does not want to be in good contact with others. And, on the contrary, we call a person cultured when he is pleasant in his interactions; we evaluate it based on both the outer and the inner characteristics. It is quite possible that, in reality, he is not that way, but this is how he positions himself. In general, corporate culture means a level of proper, friendly interaction within a group of people. There is only the desire to receive. The Creator created nothing but it. And the desire wants to become like the Creator. In what could it become like Him? In bestowal. The desire is filled with a sensation of the Creator, and this is called his “soul,” the “Divine part from Above.” The sensation of correspondence, similarity to the Creator that the desire experiences performing actions of bestowal, is called its fulfillment. It is fulfilled by being similar to the Creator. If it needs to receive to do this, it receives, and if it needs to restrict itself to do this, it restricts itself. The action is not important, what is important is to become more and more like Him. This is the Lights of NRNHY, which fulfill the desire. I enjoy not them themselves but the fact that I adhere to the Creator. That is why fulfillment could be a tiny spark of the Creator, which gives life to our world, and nothing else. Everything is in the realization of the importance of the Giver; this is what fulfills me. The similarity to Him is what I long for, and this is a spiritual fulfillment for me. Initially, there is only a spark, which emerged as “something out of something,” and a desire, which emerged as “something out of nothing,” such a primary “elementary particle,” and nothing else. And the rest is being “spread out” from the Creator, from His actions. In the News (from Lettera): “Expenses are being cut back on everything (health, school education, social assistance), but not on the military needs. The crisis prompts reducing military spending; moreover, it is possible to join forces to cut costs. “But no country is going to reduce military spending, even when there are no drugs in hospitals or a supply of blood for transfusions. The EU pays the salary of members of the armed forces, the number of whom is three times greater than in the USA – $ 360 billion a year. The US military spending is $ 711 billion. My Comment: Everything is tied to one problem—our egoism. It must be corrected at its root instead of wasting time on investigations because the Hydra’s heads always grow in new places! There is only one remedy against egoism: the force of bestowal, which can be attracted through integral workshops. You can try it and make sure! Question: Can we measure the desire of the group? Answer: Yes, if it’s really a group, meaning that it has a formed system in which you see the ten Sefirot. After all, a real group is something that exists on its own, a spiritual mechanism, a spiritual structure, a spiritual body. Question: What stands between us and such a group now? Answer: A lack of connection. We need to establish a correct relationship between us that is infused with dedication, unity, and support. We need to feel that there is no alternative, that this is our duty; otherwise, we will not achieve the property of bestowal and will not bring contentment to the Creator through the friends and teacher. We will not advance without connection, we will not be able to save the world, and will not be able to delight the Creator. Moreover, without strengthening our mutual connection, we bring damage, like someone who drills a hole in a common boat. Baal HaSulam writes in his article “The Peace,” that society punishes theft, but if a person does not add his efforts, there is no punishment. Meanwhile, he who “prays,” does so for himself and he damages society. After all, the real prayer can be produced only by a community of people who want to bring contentment to the Creator by mutual bestowal. Alone, none of us is capable because I do not have that “place,” that desire, from which I could address Him. There is no Creator without the unity of created beings who want to mutually bestow upon each other, thus giving Him a “place” to be revealed between them and to enjoy. Once and for all I have to understand that I have no “place” to be filled, no force that will help me to bestow; there is nothing. Everything is only in the connection between us. Then came Amalek, and fought with Israel in Rephidim. And Moses said unto Joshua: “Choose us out men, and go out, fight with Amalek; tomorrow I will stand on the top of the hill with the rod of God in my hand” (The Torah, Exodus, “BeShalach,” 17:8 – 17:9). Amalek is our innermost and most egoistic desire and the ideological enemy on the way to spirituality. The war spoken about in the Torah is the inner war, which is in order to unite more strongly, to discover within us more egoistic desires, including Amalek, to rise above them, and to win. In order to compete against it, we need “the elders.” This means the most corrected attributes in a person. Described here are many attributes and through their help, we go out to battle against egoism. It really appears to us as the enemy, as we see it as additional “against us,” both internally and externally. Until a person detaches himself from his inner ego, he doesn’t feel this resistance, this hostility, this hatred towards his nature. He doesn’t feel that this nature also comes from the Creator, that the Creator purposely reveals these attributes within him (after all, “there is none else besides Him”) in order to help him to again and again ask the upper force to correct him, to transcend and help him to use all his previous egotistic desires correctly in bestowal and love. This is because a person has no attribute of “bestowal.” The attribute of bestowal is the Creator, and the person has only the attribute of “reception.” Thus, “to receive for the sake of bestowal” (the use of the ego for bestowal) is a very difficult war with Amalek. If all the other previous wars for correction were created in order to rise above our ego to escape from Egypt, to exit different kinds of problems, to rise above them, then now, there is no need to rise, but to fight with the ego face to face. We are not fighting Pharaoh but simply running away from him as it’s impossible to do anything with him. Amalek is the same Pharaoh, just in another, more inner form, from which it is impossible to escape. We must face it in this way, meaning in order to tilt it towards our benefit and win so that we commit it to work for the sake of bestowal. All the cycles of time, except for the week, are related to cosmic systems: the new moon, morning, daytime, evening, etc. The week seems to have been born from the human mind. The fact is that we are inside a very interesting system: We depend on both the moon and the sun. That’s why calendars have a double nature: The Muslim calendar is based on the cycle of the moon; the Christians’ is contingent on phases of the sun, and the Judaic calendar combines both solar and lunar cycles. This is why Muslim holidays are not rigidly tied to concrete dates and “wander” from winter to summer, from spring to autumn. Christian holidays are also inconstant. As for the Jewish calendar, it is stable since it is based on the middle line: It’s not tied to the right line (as is the Muslim calendar), nor to the left line (as in Christianity), but rather it is founded on a combination of two natural forces, that of receiving and that of bestowal. We depend on the sun and the moon, on the properties of receiving and giving. We are not stuck with one particular line. That’s why our calendar is consistent. However, the Jewish calendar is not that simple! There are certain dates such as “shvita” and “Yovel,” every four years there is a leap year, and twice in 27 years there is a solar circuit, etc. But the calendar created several thousand years ago hasn’t changed. Question: So according to this calendar we can accurately figure out what will happen in the future? Answer: The fact that it’s linked to two natural forces means that we follow nature and use its powers in a harmonious way. This calendar is based on both solar and lunar cycles and it exemplifies this idea. The moon shows us how the Earth relates to the sun. In other words, if I were the Earth, the moon would show me my screen by allowing me to watch the altering phases from full moon to complete diminishment (new moon) and waxing and waning again. They would display whether I relate to the Creator and to the Light correctly and whether I change at each particular phase starting at a completely diminished state and going to the full moon, and repeating these phases again and again. The approximate four weeks that separate the waxing and waning moon comprise a full cycle that is similar to one day: “And there was evening, and there was morning—one day.” In other words, we wake up at sunrise; the sun influences us in a way that our egoism increases, thus creating the left line which leads the sun to the end of the day and eventually giving birth to the night and the moon. Lunar phases appear in different constellations and create an integral and yet simple picture; the more we explore this picture, the more we have a feeling of an absolute harmony. This is like a musician who perceives a melody deep in his heart and says: “It’s a lovely chord, a beautiful instrumentation, but it lacks one note that has to be played by a trumpet!” That one additional note by the trumpet allows us to experience the sensation of harmony. It’s overwhelming and thrilling. That’s why it’s said that the attainment of the Creator is perfection.